Mega food parks are eliminating middlemen from the farm-to-fork chain. Next winter, Pritam Singh and Hardeep Singh intend to plant wheat after they have harvested their basmati crop. For the first time, the Singhs and many others like them from Dinarpur and Sandevpur villages near Roorkee in Uttarakhand got the full payment for their basmati produce within seven days of the harvest. Earlier payment would take months, making it too late to think of a second crop. The trigger for this change is a mega food park coming up at Haridwar, 32 km east of Roorkee, one of the 30 proposed across the country. This food park, backed by yoga guru Baba Ramdev, aims to eliminate middlemen in the farm-to-retail chain for a host of products ranging from branded basmati rice to herbal creams and fruit juices. "Now we do not have to deal with middlemen, who never paid us on time and often gave us less than the market price," says Pritam. "Now that we get payments on time, I plan to cultivate wheat and other cereals as well," adds Hardeep. Farmers like them take their produce to the food park's collection centres, where it is sorted, graded, priced and paid for. Mega food parks such as the one at Haridwar, part of an October 2008 initiative by the government, are attracting the attention of health products brands, FMCG manufacturers and retail giants such as Pantaloons Retail (India) Ltd, all driven by the need to retain customers in these times of high inflation. The retail players are picking up equity stakes in the special purpose vehicles, or SPVs, that have set up the food parks. Patanjali Ayurved Ltd has a 49 per cent stake in the Haridwar park and 25 per cent in the Jharkhand Mega Food Park. Ozone Ayurvedics has a 48 per cent stake in the North East food park; Pantaloons Retail owns 30 per cent of the Karnataka Food Park, while Aditya Birla Nuvo holds 74 per cent in the Uttar Pradesh one. Acharya Balkrishna, MD of the Haridwar food park and chairman and MD of Patanjali Ayurveda Ltd., says while the food processing ministry is allocating Rs 50 crore for each food park, it expects the private partners to put in an equal share. The government is staying out of the SPVs even in an administrative capacity. The Centre's contribution of Rs 50 crore for infrastructure, which was missing in earlier schemes, has proved a booster. There are currently 10 mega food parks at various stages of development and operations. Patanjali Food Park is fully running, while the Srini park in Andhra Pradesh is partly functional. For the rest, SPVs have been formed and construction is on. "There has to be involvement of the stakeholders of the SPVs in the food park for it to succeed. For their participation, they need to set up units or be involved in the activities. 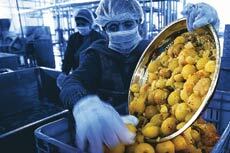 Until stakeholders at the SPV level set up units in the food park, the plan cannot succeed," says Balkrishna. Kishore Biyani, MD of Pantaloons Retail (India), expects food parks to generate huge business. "We will be sourcing raw material to the tune of Rs 600 crore, and these products will have a value of Rs 2,500 crore when they hit the retail shelves," Biyani says. The Future Group will have units of its subsidiaries such as Future Agrovet and Future Logistic Solutions at the Capitals food park in Karnataka. Of the 50 units that are likely to come up there, Future Group will probably set up five of its own. "Our suppliers and vendors will also set up units there. With intermediation costs and transport costs coming down, all the stakeholders - farmers, processors, retailers and even consumers - are set to gain," says Biyani. For all the players, food parks are about backward integration of their main businesses. Of the 40 units at the Haridwar park, 28 belong to Patanjali Ayurveda. This number is likely to go up to 65. These units process juices from amla, apple and aloe vera, corn, soyabean, barley and oats, pearl millets, or produced packaged spices and soaps. Capital Foods, which is the majority shareholder of the food park and sells FMCG products such as noodles, and ketchup under brands such as Ching's Secret and Smith & Jones, will also be setting up its own units here. Ozone Ayurvedics is also setting up units in the North East Mega Food Park. "We will produce organic food supplements, herbs, extracts and juices of fruits like passion, pineapple and oranges. Later on, we will be adding more health and wellness products that we will produce here," says S.C. Sehgal, Ozone group MD and Chairman. The Patanjali Food Park expects a turnover of Rs 4,500 crore once full capacity production is achieved. Both Future Group and Patanjali Ayurved are firming up deals with modern retail and cash-and-carry chains. "Our products are available in defence and police canteens and Viva wellness stores apart from Patanjali Chikitsalayas and Sewa Kendras. In a couple of months, our products will be on the shelves of retail outlets," says C.L. Kamal, CEO of the food park. However, even the food parks scheme has had its hiccups. For one, some shareholders have been asked to make way for others when they failed to bring in their funds in time. At Patanjali Food Park, three stakeholders will be moving out and one new one, Golden Feast, is coming in. For now, the biggest gainers are surely the farmers like the Singhs.